A little about Labor Day, Labor Day is the first Monday in September, is a creation of the labor movement and is dedicated to the social and economic achievements of American workers. 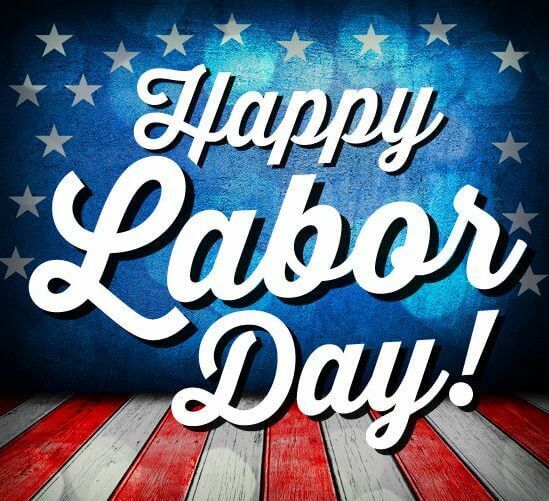 More than 100 years after the first Labor Day observance, there is still some doubt as to who first proposed the holiday for workers. Some records show that Peter J. McGuire,, or many believe that Matthew Maguire, not Peter McGuire, founded the holiday I guess the debate will go on for ages. So I guess you will have to take your pick who was the first to really found Labor Day. I’m sure no one is going to fight and complain on the subject, but rather enjoy the day off. Now that you learned a little Labor for Day knowledge, lets Git to the tasty stuff! •	Veggies such as asparagus, zucchini, corn, peppers, onions, and portobello mushrooms are great grilling choices to have on their own, as a side dish, or part of a kebab, instead of red meats, which are high in fat. •	If you want meat-based protein, chose leaner ones like chicken breast, bison burgers, salmon, tuna, or shrimp as alternatives to meats with higher saturated fat content. •	Fruits cooked on the grill add sweetness to any meal and complement most proteins. Try cutting up pineapple, mango, or peaches and grilling them for a few minutes on each side . Pass on the chips and dip. High calorie snacks like chips and dip can add 300 calories or more to your daily total. •Frozen Greek yogurt with berries: Mix 6 oz plain fat free Greek yogurt with ¼ tsp vanilla extract and place in freezer for about 2 hours. Serve with 1 cup berries or fresh fruit (150 calories). •Shrimp cocktail: Serve 7 medium shrimp with 1 Tbsp cocktail sauce (120 calories). •Diet root beer float: Add ½ cup no sugar added low fat ice cream to 1 cup diet root beer (70 calories). •Strawberries and cream: 1 cup sliced strawberries (8 medium berries) with 2 Tbsp low fat whipped topping (100 calories). •Cucumber pita pocket: Slice ½ medium cucumber into thin circles, combine with 2 Tbsp tzatziki sauce and add to a DVD-sized whole wheat pita (120 calories). •Baked peaches: Cut a medium size peach in half and scoop a small circle in the middle. Sprinkle ¼ teaspoon cinnamon and bake at 350 for 10 minutes. When cooled, fill middle with ¼ cup low fat cottage cheese (120 calories). •Caprese salad: Slice low fat mozzarella into thin slices (should look like a domino) and place them in between a tomato slice and a fresh basil leaf. Serving size is three pieces (130 calories). Here are 3 Git Right Favorites! 2. Place half of avocado in a bowl; mash with a fork until almost smooth. Add sour cream and next 3 ingredients to bowl; stir to combine. Dice remaining half of avocado. Add diced avocado, tomato, jalapeño, and 1/8 teaspoon salt to bowl; stir gently to combine. 3. Divide beef into 4 equal portions. Gently shape each portion into a (1/2-inch-thick) patty. Press a nickel-sized indentation in center of each patty. Sprinkle evenly with remaining 3/8 teaspoon salt and pepper. Place burgers on a grill rack coated with cooking spray. Grill 3 minutes on each side or until desired degree of doneness. Lightly coat cut sides of buns with cooking spray. Place buns, cut sides down, on grill rack; grill 1 minute or until toasted. 4. 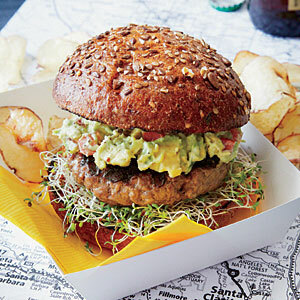 Place 1/4 cup sprouts on bottom half of each bun; top each with 1 patty, about 3 tablespoons guacamole, and top half of bun. 1. Put a large pot of water on to boil. Preheat oven to 450°F. Coat an 8-inch-square (2-quart) baking dish with cooking spray. 2. Mix breadcrumbs, oil and paprika in a small bowl. Place spinach in a fine-mesh strainer and press out excess moisture. 3. Heat 1 1/2 cups milk in a large heavy saucepan over medium-high heat until steaming. Whisk remaining 1/4 cup milk and flour in a small bowl until smooth; add to the hot milk and cook, whisking constantly, until the sauce simmers and thickens, 2 to 3 minutes. Remove from heat and stir in Cheddar until melted. Stir in cottage cheese, nutmeg, salt and pepper. 4. Cook pasta for 4 minutes, or until not quite tender. (It will continue to cook during baking.) Drain and add to the cheese sauce; mix well. Spread half the pasta mixture in the prepared baking dish. Spoon the spinach on top. Top with the remaining pasta; sprinkle with the breadcrumb mixture. 5. 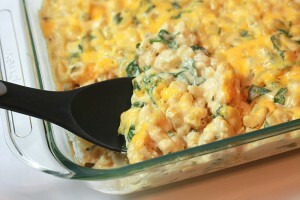 Bake the casserole until bubbly and golden, 25 to 30 minutes. 1. In a small bowl, whisk together honey, lime juice, cayenne pepper, and salt. 2. Light one chimney full of charcoal. When all charcoal is lit and covered with gray ash, pour out and spread the coals evenly over entire surface of coal grate. Set cooking grate in place, cover grill and allow to preheat for 5 minutes. Clean and oil the grilling grate. Brush each side of watermelon slices with spicy lime and honey mixture. Place watermelon and grill and cook until grill marks developed, about 2 minutes per side. 3. 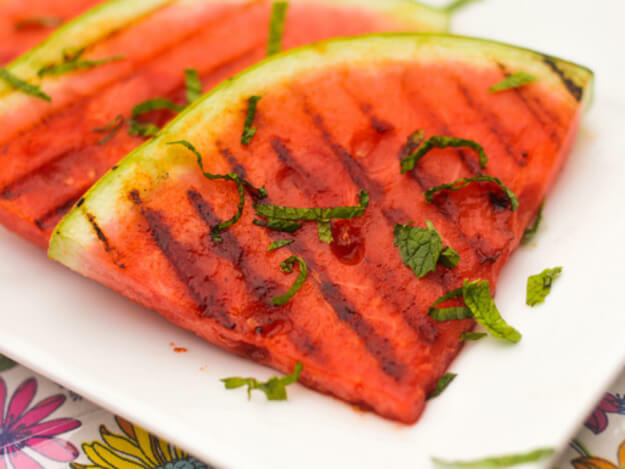 Remove watermelon from grill, sprinkle with mint, and serve. Hope you enjoyed these healthy alternatives and will let us know what you think!! Remember stay active over the weekend, have fun, and dont drink and drive!! !